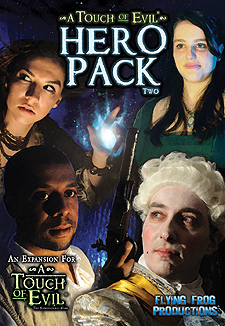 The Hero Pack 2 Expansion for A Touch of Evil introduces 4 exciting new monster-hunting Heroes, Frederic Leon the Foreign Diplomat, Sara the Bright Witch, JAck Fellowes the Privateer,, and student of the occult, Abigail Sturn. Also included are 10 powerful new Mystery, Event and Location cards as well as a deadly new Villain...The Reaper. A master of death and decay, The Reaper brings withering despair to all that it touches, casting its Dark Mark on the next unlucky victim, The Reaper harvests souls to feed its foetid hunger!